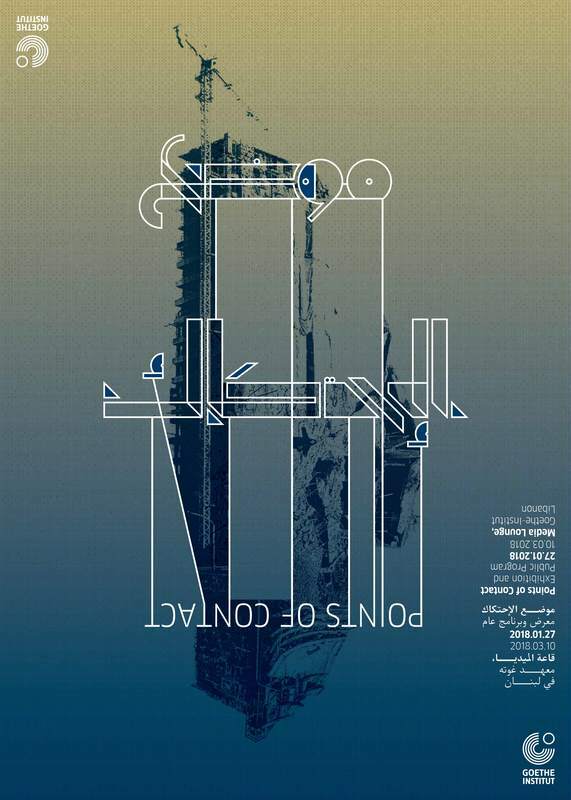 Promotional poster produced for exhibition and public program 'Points of Contact'. Design by Karim Farah. Copyright of Goethe Institute Lebanon and Karim Farah. ‘Points of Contact’ brought together multi-media responses and investigations into the architecture of the lived built environment in Lebanon. The participating artists, theorists, activists, lawyers and architects explored an interpenetration of private and public spheres affected through a lived condition of capitalism and conflict. The exhibition changed and evolved over its duration, being constructed, and reconstructed as each participant presented their work through screenings, conversations, performances, lectures, and walking tours, taking place across two experimental roundtable events on January 27 and February 17, 2018. Participants included: Shakeeb Abu Hamdan, George Arbid, Marwa Arsanios, Rayya Badran, Habib Battah, Vanessa Bowles, Hiba Farhat, Dima Hamadeh, Samar Kanafani, Helene Kazan, Jessika Khazrik, Fadi Mansour, Ayat Noureddine, Yoriko Otomo, Mohamed Safa, Rania Stephan, Sandra Schaefer. The first experimental roundtable 'Body As Testimony, Poetics and Gender' paid particular attention to the effects of capitalism and conflict at the scale of the human body, observing changes in the architecture of the built environment that take place in response to this human bodily experience. This event further questioned how dominant methods of producing evidence or giving testimony can exclude or render the human body invisible. Proposing a possible turn towards the poetics of human testimony, this event asked questions in regards to method of engaging more inclusionary account of human bodily experience of this affect? The second experimental roundtable ‘Built Between the Slow, the Structural and the Spectacular’ observed a spectrum of methods that attempt to capture and evidence the slow, structural and spectacular violent affects of capitalism and conflict, seen through transformations in the architecture of the built environment. Asking how does the lived built environment or the architecture of the domestic space becomes an archive of such transformations? Further questioning how planning methods becomes a way of speculating and projecting the affects of capitalism and conflict into the future?